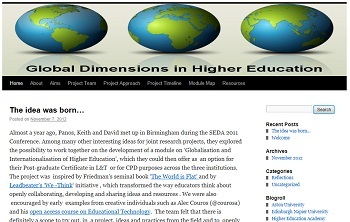 I recently posted the following on the Global Dimensions in Higher Education project blog. Given the focus of my own blog here, I’m sure my colleagues on the GD in HE project (@GDinHE) won’t mind me reposting it. In last week’s Times Higher Education (17-23 January 2013), two articles tackle between them a number of stark realities within the dominant Western discourse around globalisation in higher education. In one, Professor Thomas Docherty presents a broad-ranging consideration that questions the relationship of the university to national culture and community, and draws a sharp distinction between ‘scholarly globalisation’ on one hand and, on the other, the contradiction that centres around the rhetoric of post-national promise versus economic competitiveness. In the second article in question, Joanna Sugden tackles the recent changes in visa regulations within the United Kingdom and the barriers these are imposing on graduate students from out with the European Union. In short we welcome highly skilled non-EU postgraduate students to study at UK universities, and welcome the substantially higher fees they pay in comparison to their EU peers, but in return require them to find a job with a salary in excess of £20,000 (way beyond in certain circumstances) within four months of graduating to remain in the UK. However the position they secure must be with a registered employer that will support their application for the equivalent of the previous two-year work visa that was automatic on completing postgraduate study. One message that may be taken from both of these articles is that we may be talking global, but the focus of our thinking is often squarely within the local and national context. It is on our institutions and the socio-political climate within which they exist and are sustained, and on increasing their economic viability and growth. In the case of international postgraduates studying in the UK, the message is clear – you are welcome here while paying a substantial cost to attend university, and to remain if you are fortunate to secure a position with an employer who won’t overlook you in favour of similar candidates who do not require a Tier 2 visa. If being cynical, and realistic, we might look towards the recruitment of international students to UK and other Western universities, the establishment of campuses overseas, and some forms of the now omnipresent MOOC as being primarily or even purely about institutional competitiveness and survival within an increasingly stretched and crowded global HE sector. However whilst on one level we must address and critique the globalisation of higher education as a capitalistic pursuit concerned with the movement of educational services across national boundaries for purposes of market gain and competitive edge, we can also look towards what a globalised approach within higher education can offer in pedagogical and experiential terms. Here we can be more concerned with recognising, exploring and harnessing global and cultural diversity within our curricula and educational practices, so as to provide a richer, more democratic educational experience either on campus or online. In asking why we should internationalise and diversify higher education curricula and pedagogy, Welikala (2011) warns against the over use of the term globalisation “which is increasingly used to mean everything and nothing”, and against neo-liberal ideologies that position higher education as being responsible for “the construction of knowledge economies that will save the world from all its burning problems” (p.24). However in providing a more detailed argument than can be usefully summarised here, Welikala does make many convincing points around what a globally and culturally sensitive ‘multi-perspective curriculum’ can offer in addressing global issues collaboratively, developing rich knowledge and values of respect, and in developing the broader skills needed in a world where cultural identities, the nature of work, and our information technologies are continually evolving. If we see promise and potential in this kind of education, we also need to be aware of the divisive practices in the globalisation and internationalisation of education that must be challenged. McBurnie and Ziguras (2009) warn against the dangers of ‘cultural imperialism’ in which the establishment of overseas campuses, and the offering of programmes informed by other cultural norms and perspectives, may challenge and undermine the nation building purpose of education. We might be particularly mindful here of ‘deficit model’ practices that are all too common to observe, including the wholesale replication of curricula for delivery overseas, and the ‘flying faculty’ phenomena where by institutions send academics to support (often very experienced) overseas educators in learning how to teach their programmes just as they do. This is often without any consideration given to the weaknesses of their own academic practices, or the strengths and appropriateness of their overseas colleagues’ academic practices within their own cultural and pedagogical contexts. Similarly, in distance learning contexts, we might be mindful of online programmes that are offered internationally but are grounded in assumptions about the field or profession that are culturally exclusive and bounded within culturally narrow fields of view. Dewey (1916) discussed at length the unavoidable tensions within educational systems between the development of the individual, and sustaining the dominant practices, beliefs, industries, and expectations of the nation state. The tensions are heightened when we consider educational systems that extend across nations and cultures, and perhaps the largest threat to meaningfully addressing global and cultural diversity in higher education is that we uncritically seek to perpetuate our own localised pedagogical assumptions, practices and understandings. As we move into the next stage of developing and piloting the Global Dimensions in Higher Education module, our challenge will be to ensure we create a space for critical deliberation and reflection on our collective and individual practices and assumptions, for exploring global issues in higher education, and ultimately for asking under what conditions does globalisation in higher education serve a greater good for learners and educators than institutions and states? Dewey, J. (1916, republished 1966) Democracy and education: An introduction to the democracy of education. New York: Free Press/Macmillan. McBurnie, G. and Ziguras, C. (2009) Trends and future scenarios in programme and institution mobility across borders. Higher Education to 2030 Volume 2: Globalisation, pp. 89-108. Organisation for Economic Co-operation and Development.